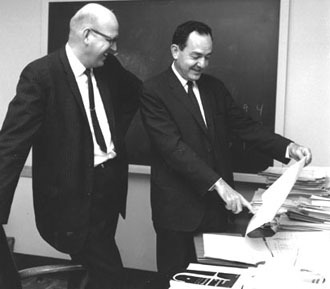 Simon and Newell next researched ways to prove that their machine mirrored the mind - that the way Logic Theorist processed symbols and heuristics to solve problems was a model of human thinking. To test their new cognitive theory they monitored human subjects thinking-aloud strategies in chess play and in solving puzzles such as building the Tower of Hanoi. What Simon and Newell found in reviewing their subjects' problem-solving strategies was that humans use a means-end form of problem solving. Humans compare the goal (end) that they seek with their present position, and judge their progress toward the goal by the success of each action (mean) they take to reach the goal. Means-end analysis had not been factored into Logic Theorist. By fall 1957, design of GPS, a General Problem Solver program using means-end analysis, was underway. The completed model set high standards for generality in programming. Its simple and constant method of selecting search paths based on previous successful choices commanded the attention of a generation of computer scientists. Designing the Logic Theorist and General Problem Solver also led Simon and Newell, in collaboration with graduate students such as Edward A Feigenbaum, to design a new class of programming languages known as list-processing languages. These became staple tools in computer programming worldwide.